Mr. Villegas’ life savings began to dwindle under the control of his daughter. He was 81-years-old with dementia and early Alzheimer’s. Frugal, he lived on a modest income. His savings was nearly $200,000, primarily from the sale of his home, but his daughter drained his account to almost nothing over the course of a few years. Without money, Mr. Villegas could not afford the assisted living he needed. Luckily, Mr. Villegas’ son Robert became aware of the situation and intervened. Mr. Villegas’ daughter went to prison for the theft and Mr. Villegas moved in with his son, where he was properly cared for. In 2011, we formed an Elder Abuse Unit to protect elders and vigorously prosecute those who take advantage of vulnerable adults. We recognized that as our population ages, there are more elders who need more protection. 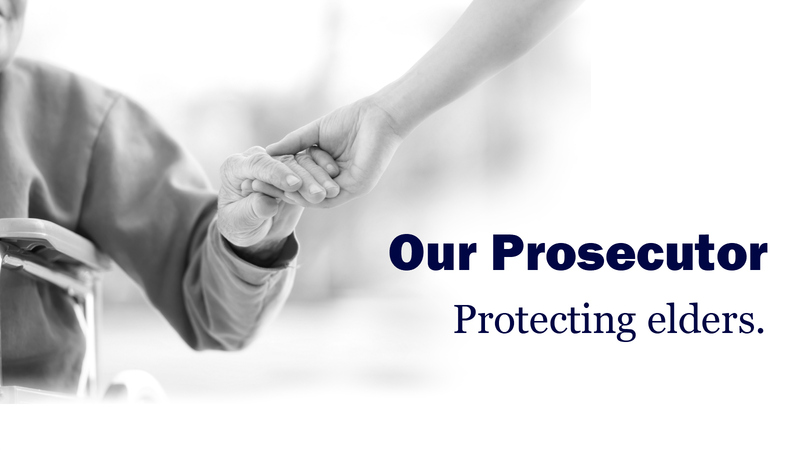 Since then, our office has been a leader in the prosecution and prevention of elder abuse, whether it’s financial exploitation, physical abuse, or neglect. Just as we have been leaders in reducing gang violence, prosecuting “cold cases,” and removing career criminals from our streets with data-driven prosecution, we have been leaders in protecting elders with a specialized team. In 2016, we won a grant from the Department of Justice of nearly $400,000 — we were one of only nine counties in the country to receive this award. The funds are being used to coordinate a comprehensive approach to protecting elders and other vulnerable adults. Initially, our Elder Abuse Unit was a one-woman team with Deputy Prosecutor Erika Nohavec. Yes, as Erika sometimes joked, there can be an “I” in team when it’s a one-woman team. Our team subsequently expanded to include two deputy prosecutors, two victim advocates, and a legal assistant. The Pierce County Council recognized the vital work we are doing and provided the additional staff. One major component of this comprehensive approach was the formation of the Coordinated Community Response Team. This group includes prosecutors, law enforcement departments, the Attorney General’s Office, Adult Protective Services, the Korean Women’s Association, and other stakeholders. Our vision is to create a safe community for vulnerable adults. Our mission is to effectively respond to the needs of older victims, hold abusers accountable, identify and bridge the gaps in services available to victims, and improve coordination between service providers through multidisciplinary collaboration. This collaboration also helps us hold offenders accountable. Working with multiple agencies, our office successfully prosecuted a caregiver in 2016 for a shocking case of neglect. Mr. Carter was found nonresponsive in his bed and was rushed to Good Samaritan Hospital. Several large and deep pressure ulcers were discovered on his backside, the worst of which was 8×13 inches and went down to the bone. His paid caregiver packed the wounds with paper towels and Neosporin. This led to a serious infection, which ultimately killed Mr. Carter. Doctors and nurses said it was worst example of neglect they had seen in their careers. This was the first murder conviction in Washington premised on a failure to seek necessary medical care for a vulnerable adult. We prosecute and we prevent. Raising awareness and educating people on how to protect themselves, their friends, and their family members is part of how we reduce crimes against the vulnerable and keep them safe. If you know of a group that would benefit from hearing from us, please let us know. Read more about preventing elder abuse in The Tacoma Weekly….